This EDH deck is pretty much one of the most simplistic decks. Since this is a solid green deck, it's already given that the main focus is purely offense. For this reason, I felt that Omnath, Locus of Mana would be an excellent choice. Due to this deck focusing on aggression, this deck has plenty of powerful creature cards. While the those creatures have expensive mana costs, there are plenty of other cards that helps accelerate the mana. I also added Emrakul, The Aeons Torn to add insult to the injury you will end up dealing to your opponents. Don't be daunted by the high cost creatures in this deck, you can get the mana out pretty early. For that reason, I have used plenty of mana producing artifacts and Green mana producing elves. In short, this deck is beast and elf heavy. 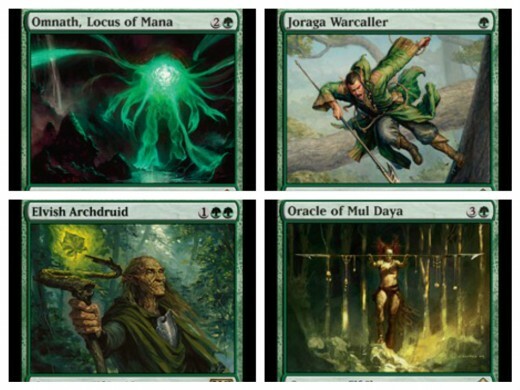 The fact that this is a solid green deck, it was a no brainer that I pick out Omnath, Locus of Mana. This is due to the theme of Green mana which is mana acceleration to bring out large creatures that have high mana costs. Due to the mana acceleration properties of Green mana, it would be logical to have a general that will take full advantage. What makes Omnath, Locus of Mana more appealing is due to its low mana cost. Even if and when Omnath, Locus of Mana gets sent out of play, you should be able to have the mana to keep bringing Omnath, Locus of Mana back over and over again. You should be able to have the mana to pay the extra mana cost. For starters, Omnath, Locus of Mana has the mana cost of 1 Green & 2 Colorless. You may most likely be the first one to bring out Omnath, Locus of Mana. After a couple of turns, provided you get more Green mana, you will get a couple of licks in on your opponents. That puts you in a better position as players can lose if they suffer 20 points of damage from generals. The two abilities of Omnath, Locus of Mana come very useful let alone to this deck. The first ability is incredibly helpful: Green mana doesn't empy from your mana pool as steps and phases end. When those phases end, you still have the Green mana. That plays onto the card's second ability. Second ability: Omnath, Locus of Mana gets +1/+1 for each Green mana in your pool. If you have six Green mana, then Omnath, Locus of Mana is a 7/7 creature. By taking advantage of the mana acceleration benefits of green, you can transform Omnath, Locus of Mana into a major juggernaut. One hit, if this general is strong enough, can remove players from the game because of the general damage. The perfect card for a mono green deck or any deck that uses green. In a mono green EDH deck, Omnath is a perfect choice for a general given its initial low mana cost and great abilities. In any Green deck, you need one major component: creatures. Creatures play a crucial role for two reasons. The first reason is that many of the creatures are incredibly big and aggressive and the second reason is that many of the creatures are Green mana producing elves. All of the creatures, except for one, are green. The one non-green card is colorless. Nullmage Shepherd – 1 Green & 3 Colorless; I picked this elf card due to it being 2/4 and an elf. Joraga Warcaller – 1 Green; This is one of the most useful cards I have seen. 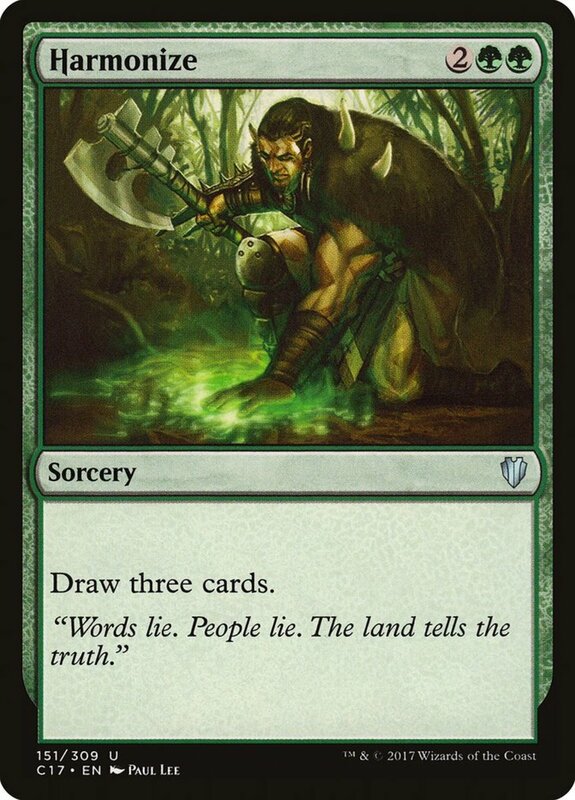 However, you should bring this card out provided you have plenty of Green mana and a couple of elves on the battlefield. For each time you pay the Multikicker cost, Joraga Warcaller gets X +1/+1 counters in which X is the number of times you paid the Kicking cost. Your other elves gets +1/+1 for each +1/+1 counter on Joraga Warcaller. Elvish Archdruid - 2 Green & 1 Colorless; This gives all your other elf creatures +1/+1 and serves as great mana acceleration. You can tap this for 1 Green mana for each elf on the battlefield under your control. Joraga Treespeaker – 1 Green; It's Level Up abilities prove valuable to mana acceleration. With a couple of elf cards and a Level 5 Joraga Treespeaker, you can have a pumped up Omnath, Locus of Mana. Llanowar Elves – 1 Green; Quick way for mana acceleration. Skyshroud Elf - 1 Green & 1 Colorless; Mana acceleration. Titania's Chosen – 1 Green & 2 Colorless; This elf gets a +1/+1 counter every time a player successfully casts a green spell. Since this deck is mono-Green full of elves, Titania's Chosen is a pretty logical choice. Keeper of Progenitus – 1 Green & 3 Colorless; This card is a double-edged sword when playing against opponents with decks using White and/or Red. However, this elf is useful to mono-Green since you have Forests. Heart Warden – 1 Green & 1 Colorless; Quick way for mana acceleration. Jagged-Scar Archers – 2 Green & 1 Colorless; It's an X/X elf in which X equals to the number of elves under your control. Its main ability serves as a deterrent to anybody that plans to attack you with Flying creatures. Elvish Piper – 1 Green & 3 Colorless; Its ability is invaluable. You can pay one Green and tap this creature. Thus, you can put a creature card from your hand onto the battlefield without paying its casting cost. Silhana Starfletcher – 1 Green & 2 Colorless; Mana acceleration and Flying creature deterrent. Ezuri's Brigade – 2 Green & 2 Colorless; Its Trample ability is useful. Don't worry about the artifacts, there are plenty of artifacts in the deck. Priest of Titania – 1 Green & 1 Colorless; Massive mana acceleration. Elven Riders – 2 Green & 3 Colorless; A pumped up Elven Riders can do damage to opponents. Druid of the Anima – 1 Green & 1 Colorless; Mana acceleration. Argothian Elder – 1 Green & 3 Colorless; Mana acceleration. 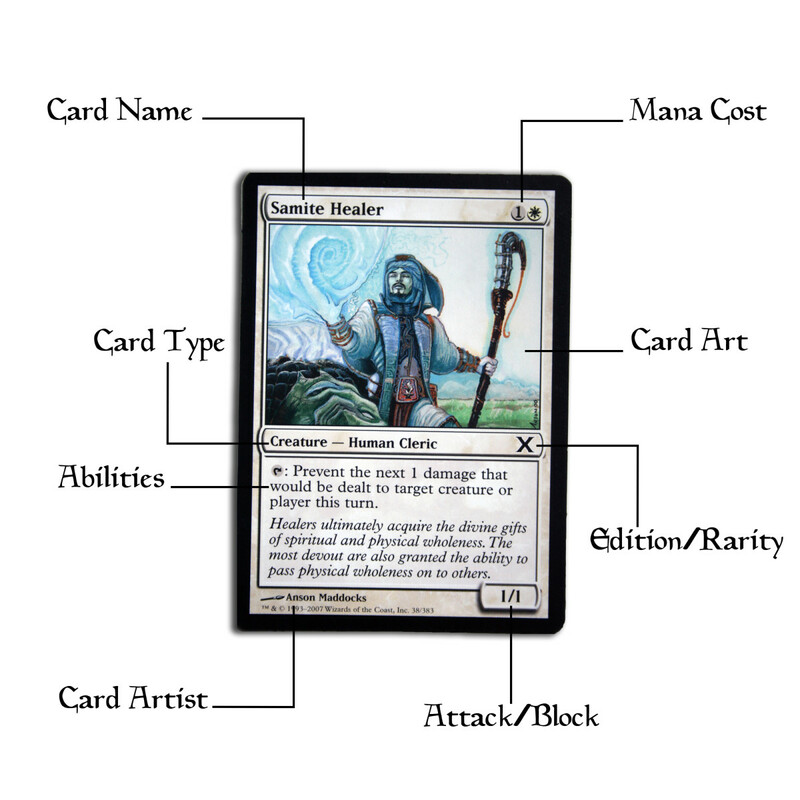 Leaf Gilder – 1 Green & 1 Colorless; Mana acceleration. Frontier Guide – 1 Green & 1 Colorless; Land acceleration. Quirion Elves – 1 Green & 1 Colorless; Mana acceleration. Wolf-Skull Shaman – 1 Green & 1 Colorless; Creature acceleration and works great with the other elf cards. Oracle of Mul Daya – 1 Green & 3 Colorless; Risky card but has useful gains such as land acceleration. Greenweaver Druid – 1 Green & 2 Colorless; Mana acceleration. Jugan, the Rising Star – 3 Green & 3 Colorless; A useful creature card to have due to its main ability. Plus, it's a 5/5 Flying creatures. Protean Hydra – 1 Green & X Colorless; This creature has X +1/+1 counters in which X equals the mana you pay. Its two abilities play off each other. By taking damage, the Protean Hydra gets stronger. Terra Stomper – 3 Green & 3 Colorless; This creature cannot be countered and this creature has Trample. Rampaging Baloths – 2 Green & 4 Colorless; Its Landfall ability goes well for creature acceleration. Combined with Oracle of Mul Daya, this creature will spawn a bunch of 4/4 green Beast tokens. Feral Hydra – 1 Green & X Colorless; Its ability is rather useful. You can pump up the creature as long as you have the mana. Ant Queen – 2 Green & 3 Colorless; Creature token acceleration. 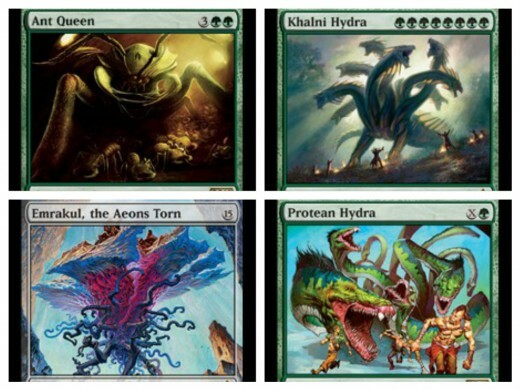 Khalni Hydra – 8 Green; Its casting cost is 1 Green mana less for each green creature you control. For the most part, you could bring them onto the battlefield for free. This creature is an 8/8 with Trample. Unyaro Bees – 3 Green; It's a Flying creature that you can pump up with Green mana. Spearbreaker Behemoth – 2 Green & 5 Colorless; It's Indestructible and grants the same ability to a target creature with 5 power points or more until the end of the turn for 1 Colorless. Great Sable Stag – 2 Green & 1 Colorless; A good anti-Blue & anti-Black creature that cannot be countered. Krakilin – 2 Green & X Colorless; It gets X +1/+1 counters in which X equals the Colorless mana you pay. Also, you can Regenerate the creature for 1 Green & 1 Colorless. Scute Mob – 1 Green; Very useful ability. Plated Slagwurm – 3 Green & 4 Colorless; This creature cannot be the target of spells or abilities that your opponents control. Kalonian Behemoth – 2 Green & 5 Colorless; It's a 9/9 with Shroud. Leatherback Baloth – 3 Green; A 4/5 creature for 3 Green. Wolfbriar Elemental – 2 Green & 2 Colorless; Creature acceleration. Thornling - 2 Green & 3 Colorless; Very useful ability. Darksteel Colossus – 11 Colorless; This creature is Indestructible. The only way to get rid of this creature is through Exile. Emrakul, The Aeons Torn – 15 Colorless; With mana acceleration, you can bring this card out early. First, this creature cannot be Countered. Second, you get an extra turn when you cast Emrakul, The Aeons Torn. Third, this creature has Flying. Fourth, this creature as Protection from colored spells. Fifth, it has Annihilator 6. Sixth, the only way to get rid of this creature is through Exile. Emrakul is a great card to have in any deck if you can bring it out in time. I enjoy having Emrakul in my deck because I use Omnath's special mana ability to bring this juggernaut onto the battlefield faster. For this mono-Green deck, I have included a couple of Enchantment spells that have proven to be crucial to this deck. I have put six Enchantment spells in this deck; while there's only six, they will more than get the job done. Mana Reflection – 2 Green & 4 Colorless; You get double the mana when you tap a permanent for mana. With lands, elf creatures, and artifacts, you should have more than enough mana with Mana Reflection on the battlefield. While the cost is pretty high, you should already have the mana acceleration by then from your elf creatures. Lurking Predators – 2 Green & 4 Colorless; This enchantment increases creature acceleration. It becomes helpful if you have Oracle of Mul Daya on the battlefield. With these cards on the battlefield, you have a chance of having either a creature or a land enter the battlefield. If it's a land, you can still trigger the Landfall ability of Rampaging Baloths. Bear Umbra – 2 Green & 2 Colorless; Incredibly useful creature enchantment. Whenever the enchanted creature attacks, you untap all lands you control. It also has other useful abilities such as +2/+2 and Totem. Epic Proportion – 2 Green & 4 Colorless; Very useful creature enchantment. For starters, it has Flash. The enchanted creature gets +5/+5 and Trample. Primal Edge – 1 Green & 1 Colorless; Gives all your creatures Trample. Beastmaster Ascension – 1 Green & 2 Colorless; This enchantment's ability is very useful. It entices you to attack aggressively. I have put four Sorcery spells into this deck. This EDH deck is not that focused on the use of Sorcery spell cards; however, these four cards will definitely come in helpful. It's best not to play these cards early in the game. It's best to wait until almost midway into the game or if/when the odds are against you. One card serves as a good anti-Blue card and the other card serves as a last-ditch effort. Tsunami – 1 Green & 3 Colorless; This card destroys all Islands. This is a useful card to use against decks that rely heavily on Blue mana. Hurricane – 1 Green & X Colorless; This spell does X damage to each player and each Flying creature. X equates to how much Colorless mana you spend. It seems to be a good last-ditch effort. On your last turn, before getting defeated, you can play Hurricane and at least take a couple players down with you. Bestial Menace – 2 Green & 3 Colorless; For five mana, you can bring out three creatures. With Oran-Rief, the Vastwood and Beastmaster Ascencion on the battlefield, these three creatures become very potent. Howl of the Night Pack – 1 Green & 6 Colorless; You put out a 2/2 green wolf creature token for each Forest under your control. You should be able to get this card onto the battlefield early enough due to mana acceleration. But, wait until you have a couple of Forests onto the battlefield. I only have one Instant spell because that's pretty much all I need. This Instant spell is called Might of Oaks. It costs 1 Green & 3 Colorless. When this card is played, Might of Oaks gives a target creature +7/+7 until the end of the turn. If you have any creatures with Trample or cards that grant the Trample, Might of Oaks becomes useful. Thus, you can pretty much deal a lot of damage to any opponent in a turn. If you use the Instant spell on an already pumped up creature with Trample, you can do a lot of damage to an opponent. If you can't, you will definitely force an opponent to sacrifice a couple of creatures to stay in the game. You can use this Instant to hurt your opponent or force that opponent to block with at least three or four creatures. Artifacts play a very helpful role in this deck. The main objective for these artifacts is to accelerate your mana pool. Also, there are four artifacts that turn the odds in your favor. These artifacts are very useful to have for the most part. I have put specific artifacts into this deck to ensure good mana on your end. Moss Diamond – 2 Colorless; Mana acceleration. You can tap it for 1 Green. Khalni Gem – 4 Colorless; Mana acceleration. You can tap it for 2 Mana of any one color. If you haven't played lands, you can use the card's stipulation to your advantage and play a land. This is good if you have cards on the battlefield with Landfall. Star Compass – 2 Colorless; Mana acceleration. You can tap it for 1 Mana of any color a basic land under your control produces. Everflowing Chalice – 0 Mana; You tap it for X Colorless in which X equals the number of times you Kicked the spell. If you kicked the spell seven times, you can tap it for 7 Colorless. Sisay's Ring – 4 Colorless; Mana acceleration. You can tap it for 2 Colorless. Paradise Plume – 4 Colorless; Mana acceleration. It's obvious you're going to choose Green. While on the battlefield, Paradise Plume gives you 1 point of life whenever a player casts a Green spell. Ur-Golem's Eye – 4 Colorless; Same as Sisay's Ring. Eldrazi Monument – 5 Colorless; This artifact, when in play, gives your creatures Flying and makes them Indestructible. The upkeep cost won't be a problem if you have plenty of creatures on the battlefield such as Ant Queen, Rampaging Baloths, etc. Sigil of Distinction – X Colorless; It enters with X +1/+1 counters. The equipped creature gets +X/+X in which X equals the number of +1/+1 counters on it. You can remove a +1/+1 counter to equip it onto a target creature. Seer's Sundial – 4 Colorless; Its Landfall ability is very useful. Coat of Arms - 5 Colorless; Extremely useful ability. Nissa Revane – 2 Green & 2 Colorless; You're not going to be able to utilize the first ability at all. But, I didn't not choose Nissa Revane for the first ability. The second and third abilities are what make Nissa Revane crucial to the deck. The second ability gives you 2 points of Life for each elf on the battlefield under your control. You add one charge counter and gain 2 points of Life for each one of your elf creatures. If you have six elves on the battlefield, you can get 12 points of life each turn. As I have explained, I placed plenty of elf creatures for the mana acceleration. Its ultimate ability is very useful as well: being able to bring all elves from your deck onto the battlefield. Thus, you have an army of elves ready to lay waste to your opponents. 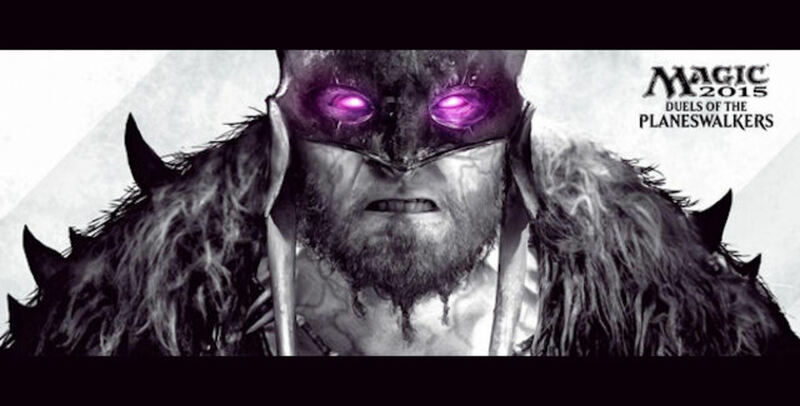 Garruk Wildspeaker – 2 Green & 2 Colorless; Its first ability is helpful as you can free up mana to use in the case of emergency. Its second ability allows you to produce a 4/4 Green beast token for the cost of removing a counter. You can go back and forth adding and removing counters from Garruk Wildspeaker. But, you want to use its ultimate ability when you are ready to take out an opponent. The ultimate ability, at the cost of removing 7 charge counters, gives all your creatures +3/+3 and Trample until the end of the turn. Nissa Revane is an invaluable card to have in any green-heavy deck that runs a lot of elf creatures. Lands play a very crucial role to this deck. I only have one nonbasic land with the rest of lands being Forest. Oran-Rief, The Vastwood; Whenever a green creature I control enters the battlefield, I can place a +1/+1 counter on it. I can use this gradually beef up creatures. For that reason, I felt this nonbasic land would be quite useful to me in this deck. This deck is very simplistic. Keep in mind, simplistic does not mean easy. When playing this deck, you want to be extremely aggressive. It's all right to be conservative with this deck; but, only a little bit. If you get too conservative with this deck, things won't work out well. This deck is built for ruthless aggression.